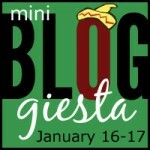 I’m joining the mini bloggiesta this weekend a little bit, trying to catch up on book reviews and other blog posts and also to get back into the book blogger crowd. Hey guys it’s been a while! Some of you are new so I never got to meet you and some of you I remember from years ago. I’ve been around this whole time I just haven’t been active in the community. I’ve been book blogging for over 10 years! OMGOSH!